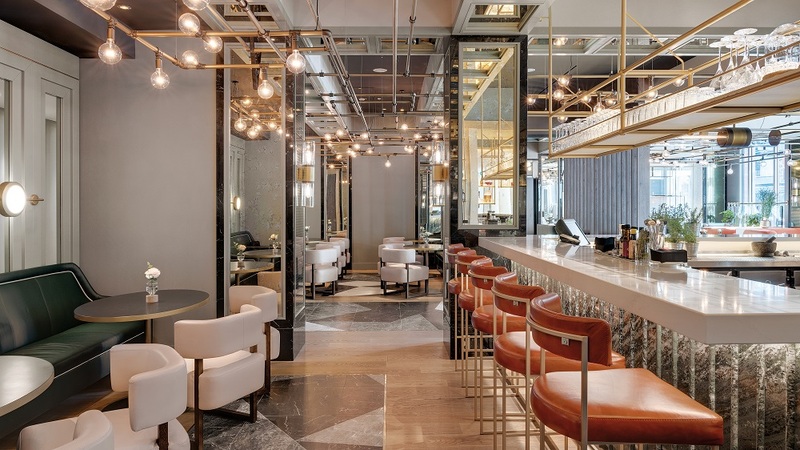 The 4-star-hotel, which is one of the leading business hotels in the Munich hotel market, has been undergoing extensive renovation works since 2017 while operating. All of the hotel’s 480 bedrooms, public spaces and technical building equipment were completely renewed. Goddard Littlefair from London is responsible for the new design concept. KMD was appointed for the entire natural stone and tiling works. Already completed are the works in the public area. The newly designed lobby impresses with a modern yet classic-luxurious character. Preto Perola and Nero Marquina marble are the distinctive natural stone types used in this area for reception desks, greeter stations and pillar trims, as well as portals and fireplaces in the lobby. The new “Juliet Rose” bar does not want to be your typical hotel bar. Munich’s new scene location captivates with its own unique concept and international flair. High-quality materials and warm, soft tones create pleasant atmosphere. The floors are made of Italian porcelain stoneware; table and bar tops are made of versatile artificial stone. 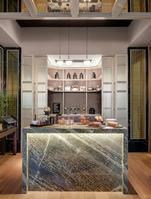 The absolute eye-catcher, however, is the Irish Green marble cladding of the coffee and cocktail bars, the latter composed of several individual round stone bars. Of course the guest bathrooms have also been freshened up. The new vanity tops made of Nero Assoluto Zimbabwe CG are timelessly beautiful. The renovation work will be completed In the spring of 2019. "Urban State of Mind - The Hilton Munich City offers a cosy atmosphere and elegant easiness."